Harder hardware! More disjointed sentences! Guess what, I found another upgrade! Have you ever tried to capture video without a capture card (The PbC had had an old Hauppage Win-TV card for the last few months with evil software)? Well, I just couldn't think of a way to do this, so I had to go out and buy one. I guess I just wasn't engineer enough for that task. There is also the fact that Babylon 5 had been moved to 5 O'clock by the Sci-fi Channel. I work / have classes until like 5:30. This obviously presented a problem. Rather than tape everything to VHS which would be both annoying and expensive (like 114 eps), I decided that this made a new capture card all the more appealing. Now, you might question my judgment here. After all, capture cards run into the high hundreds of dollars and all I really wanted to capture was B5 episodes. If so, you obviously haven't seen B5 or have poor taste. 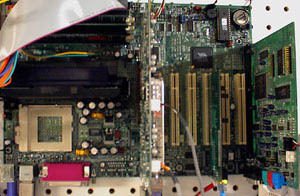 As you have hopefully read earlier, the PbC has had a Voodoo3 2000 video card installed since... Since some period of time ago... Anyway, Nvidia bought 3DFx (who made the voodoo) and discontinued all of their products and driver updates. This isolated incident leads right into me wanting a new video card. So, here I am needing a new vid card and a new capture card. Guess what! ATI makes something called the All-In-Wonder. This is a well respected line that has been in production for awhile. One of the newer incarnations is the one based on the Radeon. Since there is a newer version of the Radeon released recently, this one had just had a big price drop. For $200 I get a new video card and all the fun stuff that lets me do video capture in MPEG-1 & 2. Happy day right? Wrong, after a full 4 hours trying to make the card work, I fired off an E-mail to ATI's tech support. Everything was working except for the TV-Tuner. No TV signal was being displayed, but the sound came out crystal clear. After only two days (pretty quick turnaround for the holidays) I got my first useful response ever from tech support on the first try. Amazing isn't it? It turns out that I had committed a cardinal sin... I didn't read the bottom of the %$@& box when I bought it. I had become accustomed to being able to run anything on my main computer. Oops... The problem was that my old motherboard (Abit BE-6) was not AGP 2.0 compliant. It was only AGP 1.0. At this point I went home read the bottom of the box, ran my head into something hard and started looking for a cheap motherboard. First off, let me say that the PbC uses a Slot-1 PIII 550 processor. Let's also say that they stopped making those like a year or more ago. Taking that into account, I was still surprised when I only found one motherboard in my area that supported the Slot. Back to Computer Success (the small store where I have bought over half of the PbC's parts)! There I bought the Tyan S1854 board. I went home and stayed up till 3am taking the whole PbC apart and putting it back together. The main problem was that the BE-6 had a RAID system that gave me four IDE ports to play with. The Tyan only has two. So, after some amazing acrobatics brought on by lack of sleep I managed to get two HDDs, one CD-RW drive and, one DVD drive on there. 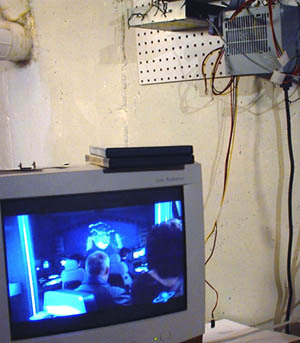 Oops, forgot to mention that, I added my old DVD drive (a Creative Encore 6x) a month ago. in addition to the Slot-1. 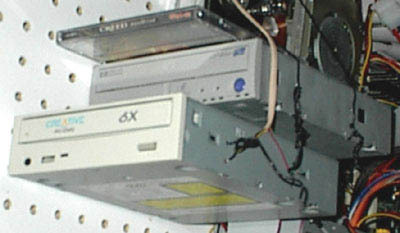 To get all of those parts on there I had to stagger the CD drives and place the HDDs at something like a 120 degree angle to each other The floppy drive ended up nestled in the middle of it all upside-down. Pretty much the only thing that stayed put was the speakers and the power supply. 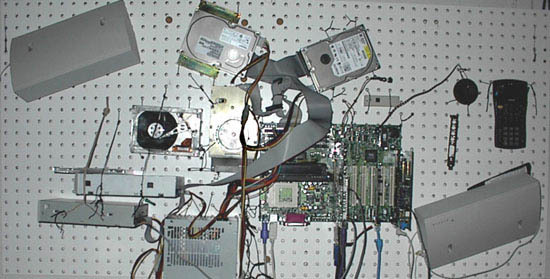 So, the Pegboard now has what I think is its fourth motherboard. After fixing all of the normal problems associated with a new motherboard, I still got no TV. This was a whole new problem however, since the TV program would not allow me to select composite as an input source. My only choices were S-Video and RCA Composite (I could get video through these). Again, I beat my head into a wall and cursed software in general. Since I had reinstalled Windows after the motherboard install I had also reinstalled the ATI drivers. A stream of expletives flew around the room, aimed at nothing in particular. A few hours later I thought to check the Device Manager to see if there was some kind of IRQ error or something. Then I saw the problem glaring at me from the screen. There were no drivers installed for the TV Tuner. Apparently, the ATI software forgot to do something important... I told Windows to search for a driver (which it found) and installed it. Guess what, no more problems! The whole thing started working! I then managed to stumble up the stairs and go to bed. As usual it was early morning by the time I had solved the problem. So there you have it... A whole new Pegboard part! Aren't you all tingly all over? Or perhaps your legs fell asleep a few paragraphs ago? Forgot just one other thing... I did actually buy another HDD for the PbC when I got the Radeon, so don't go looking for it in the last few sections. Not that you probably care all that much, but I just couldn't sleep unless I put it in... I'm sure you understand. Right? I give you the new Pegboard Computer!!! 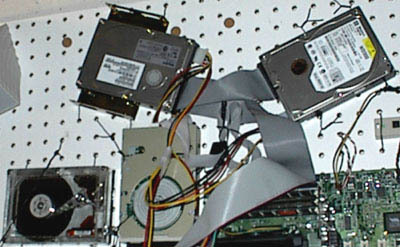 The floppy drive is hiding near the middle behind an advanced "Glare Cloaking Device"
I bet you didn't see it coming 'till I just told you and it hit you between the eyes and it hurt and you yelled ouch and I laughed and then you punched me and I yelled ow and we all had a good laugh.